Jug End was another historic area in the extreme SW part of Massachusetts. The name comes from the German "jugend" meaning "youth". It lasted for about 40 years, from the late 1930's into perhaps the early 80's. The area utilized the Jug End Barn which was built in 1928 as a deluxe cattle barn. 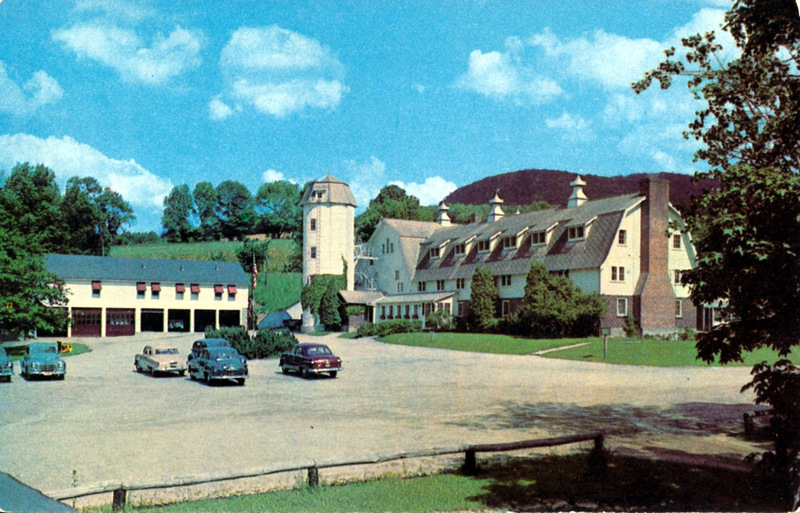 In 1935, the barn was turned into a hotel, and was run by the Guilder Hollow Club for winter sports, as the ski area was originally a hike up and ski down area located on Mt. Sterling. 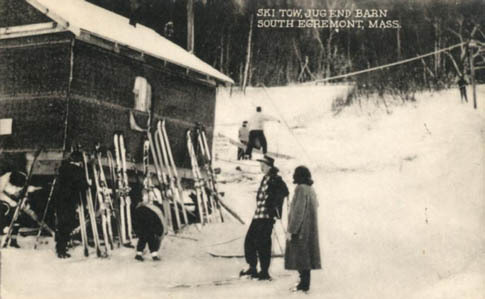 Local residents purchased the hotel/ski area in 1947, and installed two rope tows shortly thereafter. This was followed by a 1500 foot Mueller T-bar in the early 1960's. The area eventually ended up with 6 trails on a vertical drop of 350 feet. This area, from what I've heard, was quite a party place, with lots of activity. It likely closed around 1980. 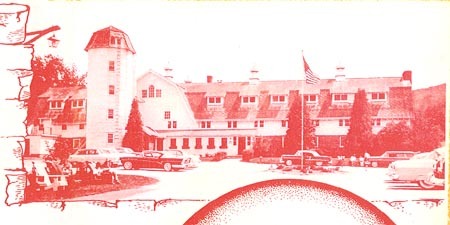 A picture of the area from a 1957-1958 placemat, thanks to Barbara Mohler. Today, the site of the hotel is a completely different place. 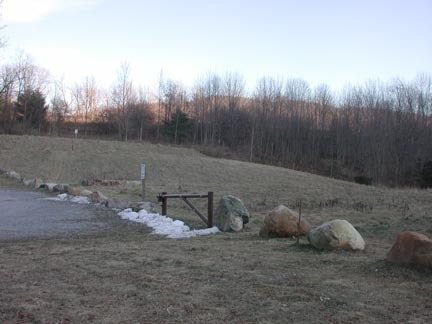 This picture was taken in January, 2002 (notice the lack of snow! ), taken just behind the site of the flagpole in the above picture. 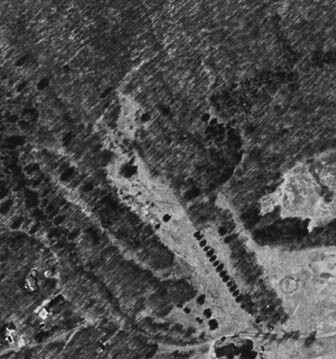 Just above and to the left of the gate is a circular foundation. This is the old silo. How sad! 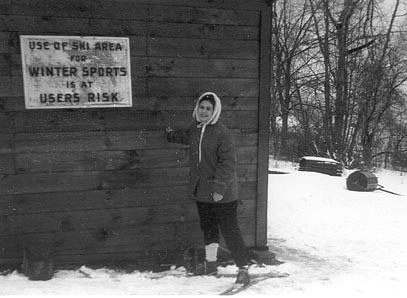 Joan Fusco: I grew up near the resorts of the Jug End Barn (now closed), Catamount (still operational) and Butternut (still operational) -- among dozens of others -- in Western MA in the 1960s-early '80s. Watching the TV program, then checking out your web site, really brought back many fond memories of my childhood. 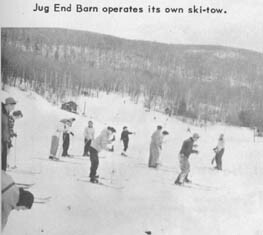 My sister and I just drove by the old Jug End Barn this Christmas vacation and laughed about the old rope tows, the rundown remains and ski trails of which you can still see at the site. Since Gortex gloves didn't exist back then, my mom would knit us mittens which would get torn to pieces on the rope tows. I must have gone through dozens of mittens each winter until the resort closed down. Barbara Mohler: Barbara sent us some great shots of the area, including the above logo, 1957-1958 brochure, and pictures from a January 1958 trip, below. Here are some more details that she shared with us. "With regards to the 1958 picture above, there were rooms in the main part of the barn, but also in the silo. I always wanted to sleep in the silo, but never had the chance to do it." The rest of her story/details are in the pictures she took below. Capt John Robertson: I went there in 1987 and took many many pictures when the place was deserted. I wanted to walk into the remains but there were birds in there and it was dark and didn't know how safe it would be. 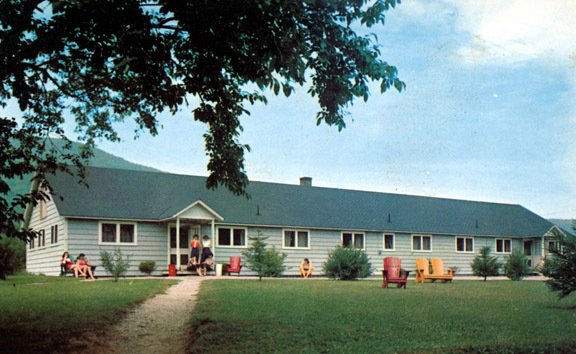 My mother and father spent their honeymoon there in early 1952 when Dad was stationed at Langley AFB, Virginia. Many bldgs existed too on the lot, more built since my folks spent their honeymoon there in early 1952. They went there because my mothers cousin Lothar and his wife from New York had also spent their honeymoon there and said it was a good place for young kids to go. Mom said that they had the one bar nearby that was called the Bull Pen where only the men could go inside to drink. It was located near the main barn but unattached to it. 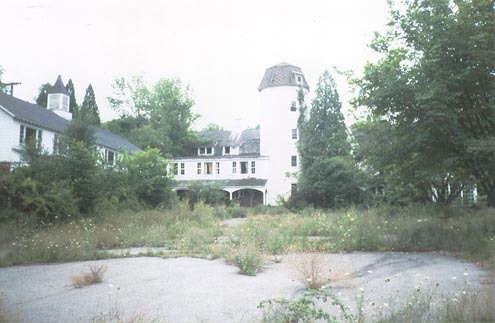 In 1993 it was gone and torn down and only the foundation was there. I also have a picture of the swimming pool as well that was deserted in the back of the hotel. The kitchen and all was still intact. The airconditioning units from each room were removed and no one was around. I was able to park in the parking lot in front since the barrier chain was removed and one could drive up there. Mom had a jacket as well as Dad when I was younger in the 1950's. But those are both all gone now. I do recall the oval sticker on luggage that Mom had when I was younger. Check out John's photos below. Douglas Fields sent us the following four images from the early 1950's showing Jug End in its prime. Click on each to view the larger version. Here's a view of the parking area and the barn. A view of the lodge. 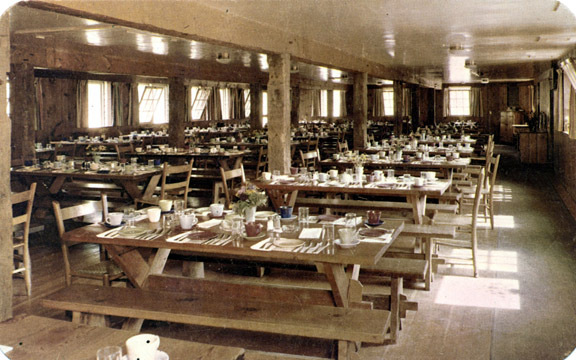 Cafeteria and dining room, quite rustic. 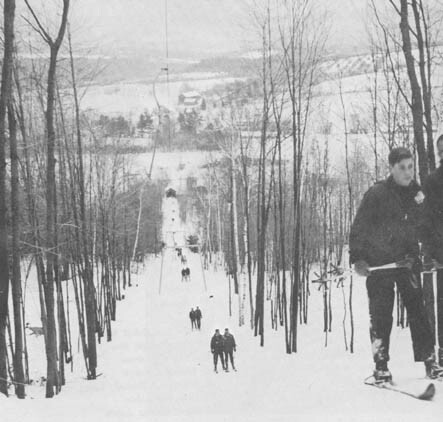 Here's a picture of skiers enjoying the slopes in 1953 (from Where to Ski). 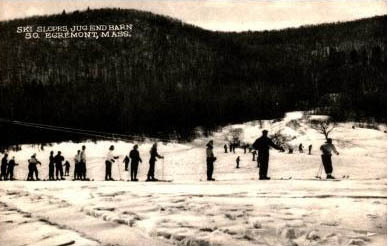 Skier's lining up for one of the original rope tows. More skiers likely lining up for the lift. A 1957 ad for the area. Barbara Mohler's friend Maryann next to a sign saying that the use of the area is at user's risk. Notice the snow packer to her right. January 1958. 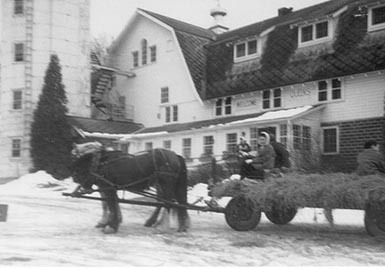 Barbara's shot of a sleigh ride at the hotel, January 1958. From Barbara, "Yes that is a horse drawn hay wagon in front of the Barn. I remember singing as we rode along the rural countryside in that hay wagon. 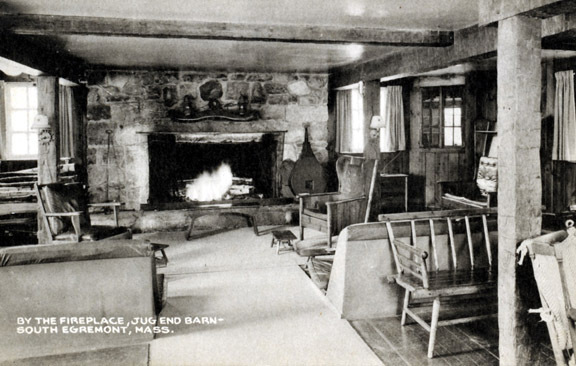 The Barn offered many activities in addition to the famous skiing challenges." Here's Barbara hiking close to a brook right behind the barn. From Barbara: "We had a chance to hike in the snow along a brook. 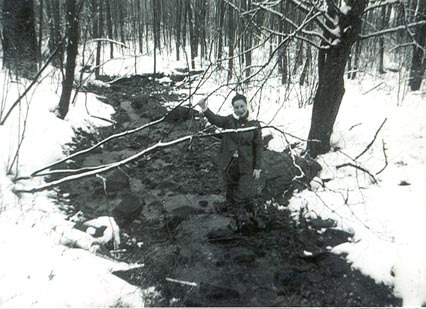 The water level in the brook was low at the time because the snow did not have a chance to melt in the middle of winter. That's me standing on a rock, holding on loosely to a shrubbery branch." 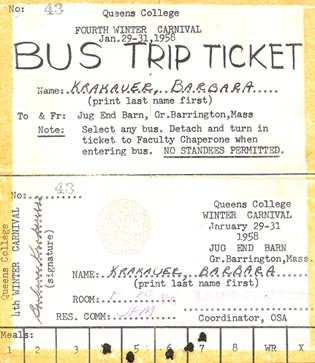 A bus ticket from Barbara, as the trip originated at Queens College. The Mueller T-bar, a classic for its time. The lift line was completely in the woods. 1963. Here's the ad for Jug End that appeared in the 1964 Ski Map. 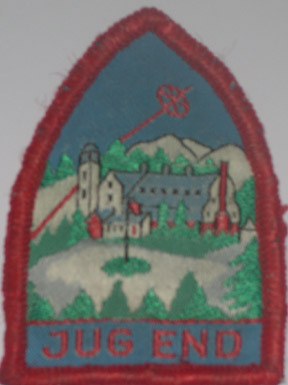 DJ Sprowl sent us this patch from the early 1960s He got it during a weekend CYO (Catholic Youth Organization) ski trip there. Capt. 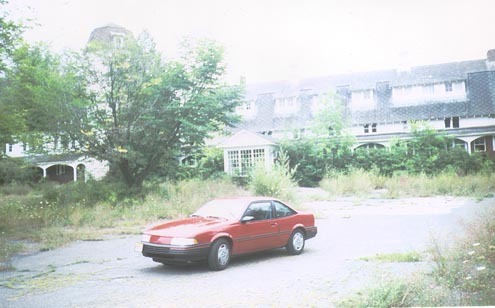 John Robertson visited the area in 1987 and took the following 4 pictures. 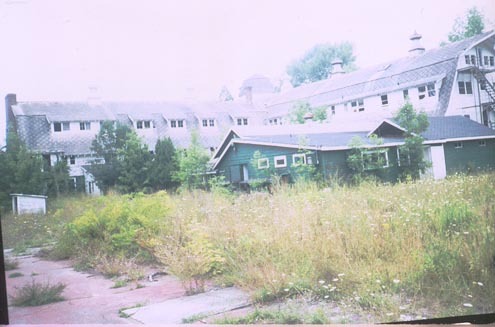 At that point, the hotel was still there, though abandoned. This view is taken about 90 degrees right of the the above photo. More of the abandoned Barn and silo. 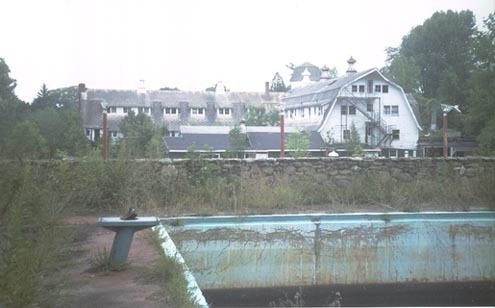 The abandoned swimming pool. This is now all filled in, you'd never know it was there. A view of the slopes today. Notice how they are still fairly clear. Also notice the line of pine trees that separated the T-bar from the slopes. Picture found by Betsy McDonough. If you have more info on this area, just email us.